Now that its summer, it became harder than usual to avoid oiliness. The heat of summer is equals to melted foundation and sweaty mornings. Ugh~ During these days I avoid too much product layering, though when in terms of makeup I am only a minimalist (thin liner, tint and powder and I'm good to go! mehehe, the power of always being in a hurry!) 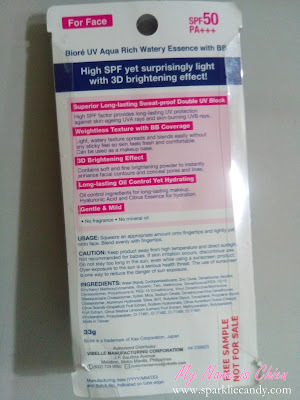 I often forget to put sunscreen, good thing that I am a fan of bb creams because they are multi purpose, foundation and sunblock in just one product. However some of the brands I use are quite heavy and worst is that it makes me oily and it settles on my pores. Arrgh. 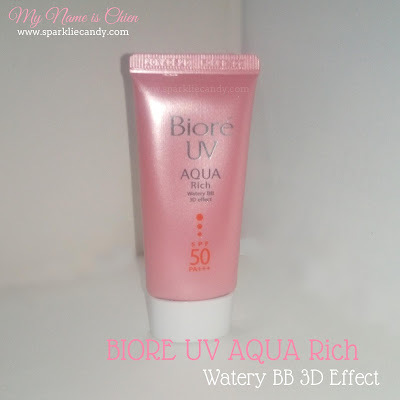 So while looking at my stash I found Biore UV Aqua Rich Watery Essence with BB SPF 50 PA+++. 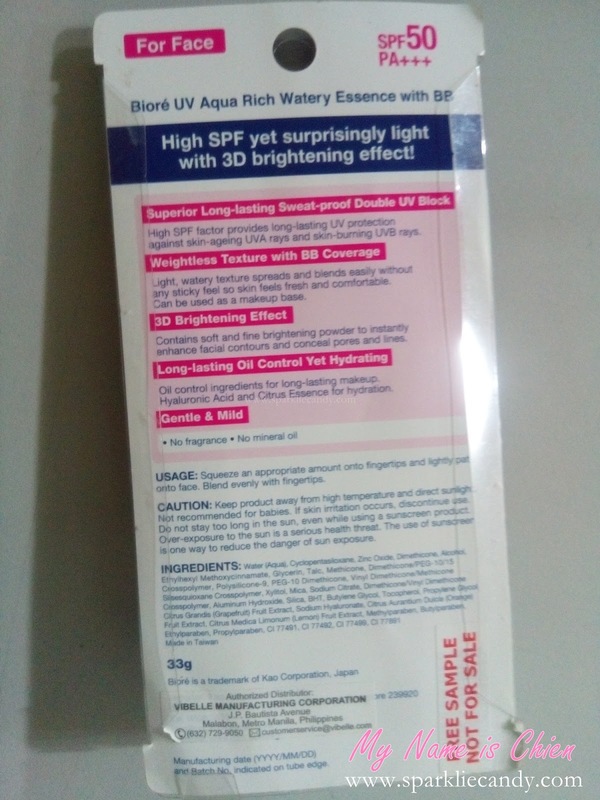 A BB cream with very high SPF. It comes in one shade and it offers light to medium coverage. No oil but contains parabens, basically its water based. It comes in a handy tube, just the right size like Maybelline. I think it only comes in one size as well. The tube is very girly, the color is pearl pink and I super duper love the color. <3 The tube dispenses only just the right amount of product each and every time. 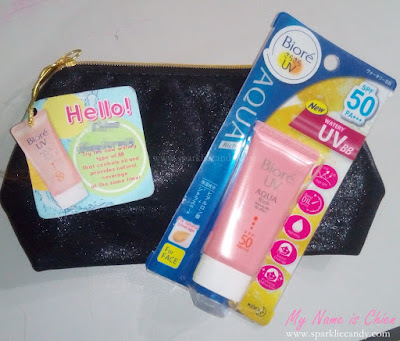 When I first got hold of Biore UV Aqua Rich Watery Essence with BB SPF 50 PA+++ (such long name, phew~) I was confused if its a sunblock or a bb cream. Upon research I found out that its supposed to act like a color correcting cream. This is my very first Japanese bb cream and I don't know what to expect. When I made a swatch it became more evident that the coverage is very light. I find that a little goes a long way with this product, its not runny but not oily at the same time, it spreads really easily. Weightless Texture with BB Coverage - Its very light like its not there. I can even apply this alone (without any moisturizer underneath when I am running late for the office). I use this both under powder and sometimes even liquid foundation and it never caked! I have never worn this alone because I will look oily. 3D Brightening Effect - After one application face looks glowing and its even yellow based unlike the usual grayish undertone bb creams. It fits all skintones as it adapts to the skin tone after a few minutes. It also doesn't settle in my pores and that is a huge plus. Long-lasting Oil Control Yet Hydrating So it contains hydraulic acid and citrus for hydration, It doesn't tug and blends so well. Its perfect as a makeup base, I just top it off with powder foundie to at least mattify the product. Gentle and Mild I like scentless for face products so the fact that Biore bb is unscented is great. I've used this also when I was suffering from too dry skin and I am glad to say that it doesn't highlight dry patches. I found out that they have this at Landmark, online its available at www.beautymnl.com. Price as per last check is P450. Multi-purpose: Sunblock and makeup base in one! If you have combination skin like mine you can use loose powder to mattify the bb cream. Do not wear this if you plan on having photo shoots, I bet there will be serious white cast due to the high spf. Prolly yes! I like how Biore UV Aqua Rich Watery Essence with bb instantly brightens up my complexion and I still put despite the heat. Its also affordable because one tube will last a long time. Anyway I want to try a good makeup remover, any suggestions? Cheer up baby! Cheer up baby! Sometimes all we need is a happy song to kick start the week. Till next post guys!